Firefighters took about two hours to extinguish a fire that broke out at the headquarters of pest control company Rentokil Initial Singapore in MacPherson yesterday morning. As the fire raged, dark dense smoke could be seen billowing from the building hundreds of metres away. The Singapore Civil Defence Force (SCDF) said in a Facebook post at 9.40am that it had been alerted to a fire at 16 Jalan Mesin. When firefighters arrived at around 9.20am, the flames had fully engulfed a storage area on the ground floor of the three-storey building, said the SCDF. The fire involved pest control equipment. A woman who evacuated the building was taken to Raffles Hospital complaining of back pain, the SCDF said in an update around noon. She was discharged later in the day. No other injuries were reported. A total of 14 emergency vehicles and about 45 firefighters were deployed for the operation. At the height of the blaze, seven water jets and foam were used to bring the flames under control. Damping-down operations to prevent rekindling of the fire from the hot, burnt surfaces were still being carried out around noon. Looking out of the window from her 10th-storey Housing Board flat, she saw three fire engines heading to the scene of the fire. The area has several industrial buildings. A female employee was taken to hospital due to a prior injury, the spokesman said, adding that the company is looking into the cause of the fire. The spokesman also said that all staff take part in fire drills twice a year, and are trained to evacuate the building within five minutes. 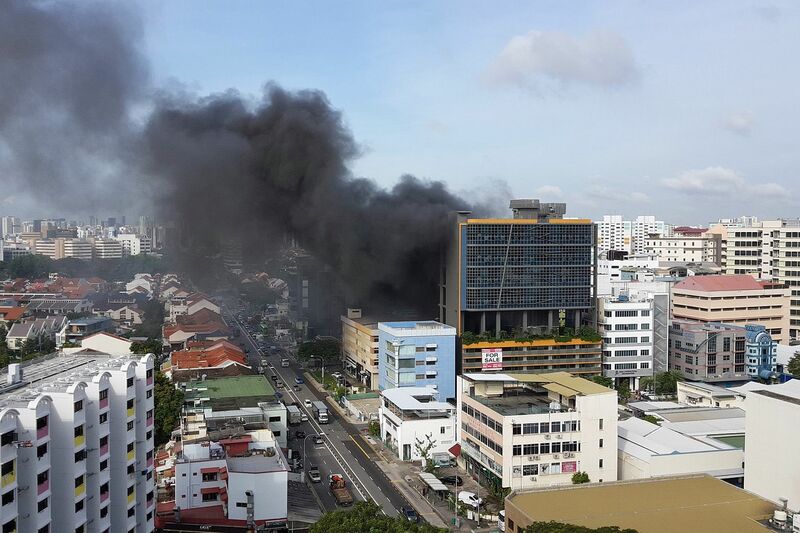 Dense smoke could be seen billowing hundreds of metres away after a fire broke out at the headquarters of pest control company Rentokil Initial Singapore yesterday morning in MacPherson. Fourteen emergency vehicles and about 45 firefighters were deployed, and the blaze was put out in two hours. A woman who was evacuated from the building was taken to hospital complaining of back pain, and she was discharged later in the day. No injuries were reported.